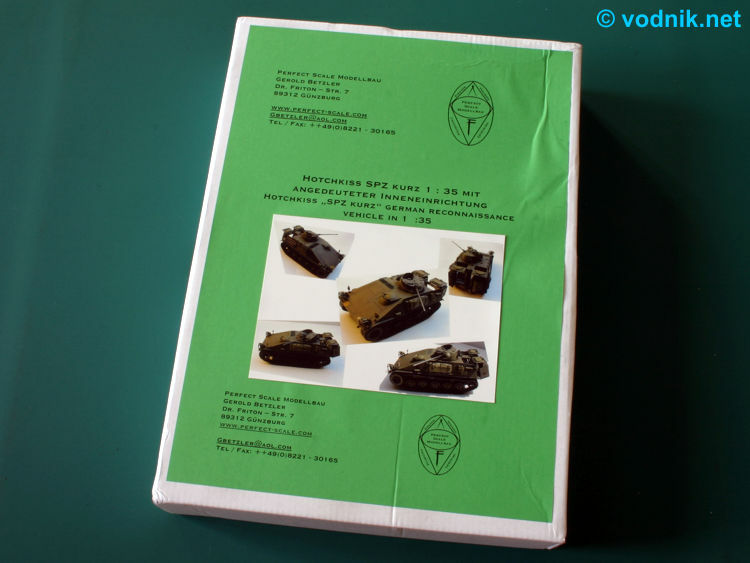 In 1958 the Bundeswehr introduced a new structure of the army units and it became obvious that at the time there was no vehicle in the inventory suitable for the role of the light IFV and reconnaissance vehicle to equip Panzergrenadiers. Decision was made to order modified version of French Hotchkiss TT6 vehicle, which in German service received a name Schuetzenpanzer kurz (SPz kurz = IFV short). Modified vehicle had five road wheels per side, while French original had four, and the turret with 20mm automatic cannon (from HS30 vehicle) was installed. The vehicle served until early 1970s when it was replaced in reconnaissance role by SpaehPz 2 Luchs and in IFV role by SPz Marder. Until now no model kit in 1/35 scale existed of this vehicle, but German manufacturer Perfect Scale have just filled this void releasing full resin kit of this important (in Bundeswehr history) vehicle. The kit comes in quite large cardboard box - about the size of typical plastic kit box (the lid is slightly bigger than A4 sheet - what a contrast to the tiny box to which Accurate Armour managed to squeeze their M114 resin model!). Inside the resin parts packed in a few zip-bags are well protected by a lot of styrofoam chips and shredded paper. In one of plastic bags I noticed two metal parts - machined brass cannon barrel and a length of copper wire. Instructions are given in the form of three sheets of paper, two A4 sized and one folded A3 sized, all printed on both sides. No decals are provided. One of instruction sheets contains a list of all included parts - very useful to check the completeness of the set. 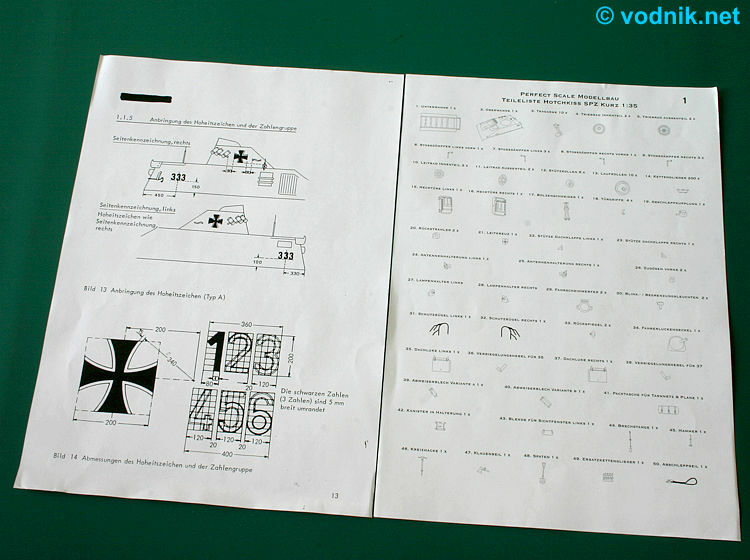 Each part is shown on drawing and also named, although only in German. According to this list we get 316 resin parts in the set plus brass barrel, but as I mentioned earlier we also get a length of copper wire. There is actually more resin parts included, as we get a few more (spare) door handles (part 18) than the 4 pieces listed in instructions. 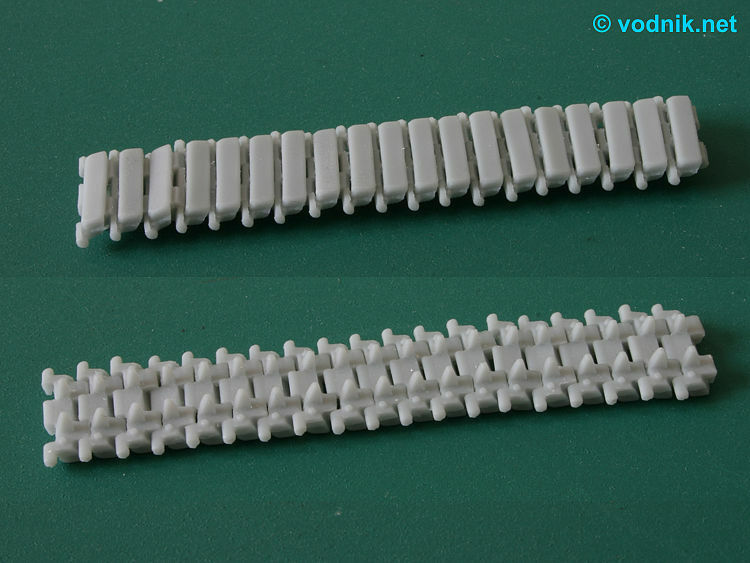 200 of resin parts are individual track links (incl. 18 spare links). Second sheet of instructions contains some general assembly guidelines (in German and English) on one side and marking diagrams on the other. 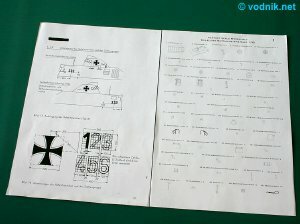 Marking diagrams seem to be copied from some Bundeswehr technical manual and they show exact dimensions of tactical numbers and German national symbols and their positions on the hull and turret. Text descriptions on this sheet are only in German. As no decals are given modelers must find their own source for these markings (or paint them!). The largest instruction sheet - A3 sized folded in half, contains the actual assembly instructions in the form exploded diagrams. The instructions are generally clear, although locations of some parts are not obvious and some reference photos are a must to attach them properly. Also the shape of three handles that must be made from copper wire is not precisely shown (some templates could be useful). Painting references are given in a few places in the instructions using generic color names and only for the vehicle base color the Revell brand NATO Olive paint is suggested. 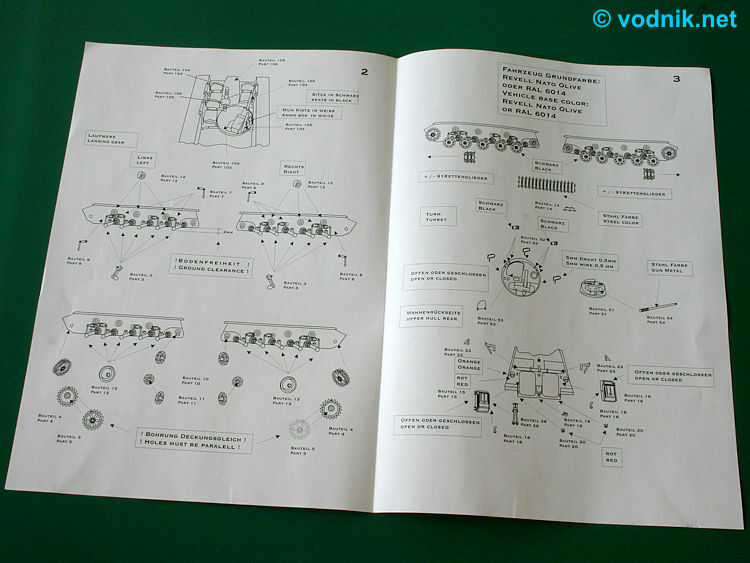 Instruction sheet with assembly diagrams. Marking instructions and parts list. All resin parts are attached to casting blocks, but attachment points are quite small and they should be relatively easy to remove for anyone with minimum experience in working with resin kits. Parts are well protected in the box, but still in my kit one of quite complex headlight guards was broken. It should be very easy to glue together however. There is some flash on parts, but not much. 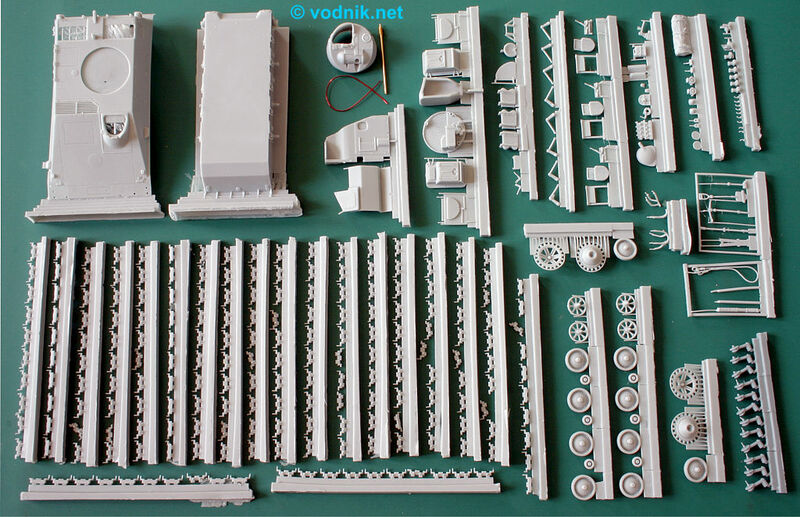 On some parts there are deliberately some additional resin pins and plates added to help in casting process and these need to be removed, but a small problem here is that in a few places it is not quite obvious where the actual part ends and where the casting aid begins. There is quite a few of air bubble holes present in parts, but majority of them is in places where they are easy to fill and remove. Actually I have not found any air bubble that I would qualify as serious problem, although for example one of handles for top hull hatch lost half of its length because of air bubble. 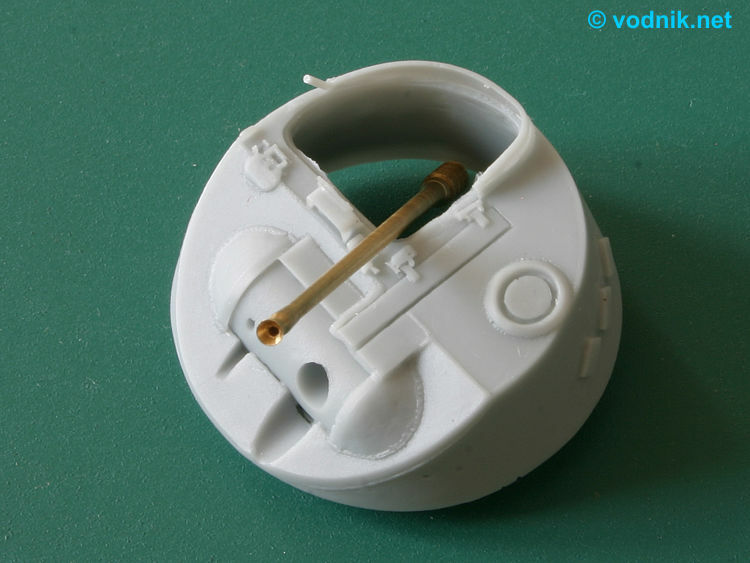 This is however small and simple part and easy to rebuild from a piece of styrene. I have not noticed any warped part in my set. The most tedious task during assembly is cleanup of track individual links. Luckily they basically snap off from the casting block with almost no cleanup needed in this place, but two resin pins (casing aids) have to be cut off from sides of each link. Once these pins are removed and links are separated from the casting block, they can be assembled together and while the fit is reasonably good some additional trimming is needed to make it perfect. All parts have crisp and very well defined details on them - among the best I've seen in resin kits. Machined brass barrel is also very well made with hollowed flesh suppressor. 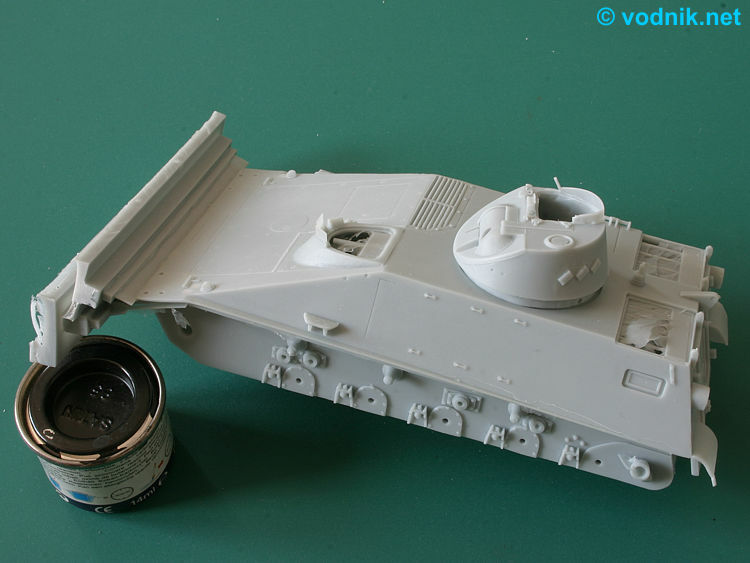 The split of parts in the kit is similar to any typical plastic AFV kit with upper and lower hull parts (both hollow), separate suspension arms and shock absorbers, wheels (sprockets and idlers composed of two pieces each) and one piece turret with positionable hatch (but mantlet is casted integrally with turret shell and fixed in one position). Driver's hatch and troop compartment hatches (two on the top and two at the rear) can all be attached open or closed and have details on both sides. The partial interior for the troop compartment and turret is provided, but nothing is given for the driver's seat area other than engine compartment walls. A lot of small detail parts for the upper hull is provided, including nicely cast pioneer tools and resin tow cable (so nice that replacing it with metal cable is not really necessary) and small shield for the left hull side is given in two optional variants. Main hull and turret parts - the tin of Humbrol paint to show the size of the kit. One piece turret and brass cannon barrel. Various detail parts - note broken headlight guard on top left corner of the photo. Click on pictures to enlarge. "Dry assembled" length of tracks. 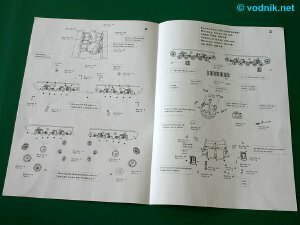 I compared the parts in Perfect Scale kit to photos of real vehicles, available in the Internet, and noticed some small differences in details. Most likely they are caused by slightly different variant or production batch being portrayed by resin kit. One most noticeable difference is that all photos of real vehicles I saw, show small rectangular guards over the driver's periscopes, while in the kit periscopes are "bare", without any covers. All major features of the vehicle are however captured very well and look spot on. I measured the kit upper hull part and compared results with a set of real vehicle dimensions, which I found here: http://www.pzaufkl.de/hotchkiss.htm. Initially I thought that the model is about 4 mm too short, but it was because I didn't take thick rear doors into account. With them the length is correct. New Perfect Scale kit looks very promising in the box and should look excellent once assembled. 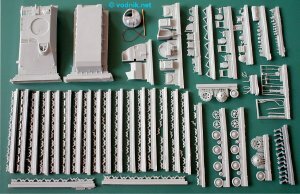 While some reference photos are necessary, the assembly otherwise is quite straightforward and modelers even with just basic experience in resin modeling should have no serious problems building the kit. The subject while not very popular worldwide, should be very welcome by all Bundeswehr vehicles fans as it was and still is quite popular vehicle in Germany, but would also fit nicely in any modeler's collection of modern AFVs. The kit is definitely not cheap at 89 Euro, particularly that decals are not included, but the high quality justifies the cost and it is the only game in town in this scale. 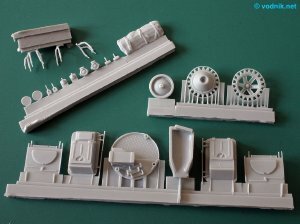 UPDATE: I just found out that the Perfect Scale kit is not actually the first kit of the SPz kurz available in 1/35 scale. Gerold Betzler of Perfect Scale let me know that there is other resin model of this vehicle available from German RN Modellbau company. The price of that other resin kit is however much higher at 99.90 Euro.